The Washington Capitals, fresh off their fourth straight win on home ice – a 5-2 win over the Colorado Avalanche on Tuesday night – try to break out of a road slump when they head to Boston to take on the Bruins on Thursday evening. The Caps have lost four of their last five contests on the road and have yet to put together consecutive wins on the road this season in assembling a 6-7-1 record away from Capital One Arena. On the other side, the Bruins will bring a three-game home winning streak into this game after alternating wins and losses over their first 12 contests (6-4-2) at TD Garden. Boston has had a very up-and-down record on defense at home this season. They allowed three or more goals in each of their first four home games this season, followed that up with allowing two or fewer in three straight, then allowed three or more in five consecutive games before clamping down in their three-game winning streak at home, allowing just four goals in all. That brings us to goaltender Tuukka Rask, who has not been an especially consistent or efficient netminder at home, even if he has been “effective” as measured in his goals against average. Among 38 goalies logging at least 250 minutes on home ice through Tuesday’s games, Rask ranks just 22nd in save percentage (.915). He suffered from inconsistent performances at home over his first eight appearances at TD Garden this season, going 3-4-1, 2.62, .906 and failing to win consecutive decisions. He might be righting himself, at least on home ice, having gone 3-0-0, 1.33, .945 in his last three appearances at TD Garden. In 17 career appearances against the Caps, Rask is 1-10-5, 3.07, .889, with one shutout. Given that this game will be the second of a back-to-back set for the Bruins (they play in Detroit against the Red Wings on Wednesday night), it could be Anton Khudobin getting the call. Khudobin has had numbers somewhat similar to Rask (a .922 save percentage overall to .912 for Rask, a 2.53 GAA to 2.43 for Rask), but he has skated in better luck with a 7-1-2 record in 11 appearances. And that loss in regulation only came in his last appearance when he allowed four goals on 14 shots in 24 minutes of work in a 5-3 loss to the Nashville Predators on December 4th. His luck appears to be especially evident on home ice, where he is 3-0-1, 2.97, .906, three of his appearances ending with save percentages under .900. In eight career appearances against the Caps, Khudobin is 4-3-1, 2.59, .919, with one shutout. David Pastrnak has done the most damage at the offensive end at TD Garden so far this season, leading the team in home goals (eight) and points (14). He has points in each of his last five home contests (2-4-6, plus-3) and in seven of his last eight games at home (4-5-9, plus-1). It is part of a larger pattern of enjoying home cooking for Pastrnak, who has 41 goals in 96 career games at home (0.43 goals per game) versus 32 goals in 103 road games (0.31 goals per game). One indicator of how well the Bruins might be doing is in his ice time. Boston is just 2-4-1 in seven games in which he skated more than 20 minutes this season, but they have not lost when he logged less than 17 minutes (6-0-0). Pastrnak is 3-3-6, minus-4, in seven career games against Washington. 1. Boston is very stingy about letting teams get shot attempts. They have allowed the fewest shot attempts at 5-on-5 in the league (1,133/42.0 per game). 2. Only the New York Islanders have fewer losses in regulation when scoring first in games (none) than Boston (one, tied with three other teams through Tuesday’s games). 3. Three teams in the NHL have not yet won a game (through Tuesday) when trailing after two periods. Boston is one of them. Nashville and Dallas are the others. That might seem odd since they have 49 wins among them. 4. No team has more major penalties on home ice this season than the Bruins (eight). 5. Boston is one of two teams in the league to have scored and allowed fewer than 30 goals this season in all of the three regulation periods of games (San Jose is the other). 1. Washington has the second best goal differential in the first periods of games in the league at plus-9 (Winnipeg is plus-11). 2. The Caps have the second-best road power play in the league (26.3 percent), trailing only Pittsburgh (31.4 percent). If only they had more chances; they rank 25th in power play opportunities on the road (38). 3. The Caps have four players in double digits in points in road games this season – Alex Ovechkin (15), T.J. Oshie (15), Evgeny Kuznetsov (14), and Nicklas Backstrom (12). John Carlson could join that group with a point in this game. 4. Speaking of Carlson, he and Brooks Orpik share a number they would probably not like to own on their own, let alone share. Both are minus-12 on the road, tied for sixth-worst among 748 skaters through Tuesday’s games. 5. Washington has more wins when leading after one period (13) than any team in the league. Only two teams have more wins when leading after two period than the Caps (14) – St. Louis (17) and Tampa Bay (15). Intermissions matter, it would seem. Brad Marchand, villain and despised player in 30 NHL cities, is closing in on a personal milestone. He is three points shy of 400 for his career, which is about the number of slashes and spears he has (seemingly) gotten away with over his nine-year career in Boston. Which brings us to another milestone. With 536 career penalty minutes (you can be forgiven if you thought it was more), he is seven short of tying Gord Kluzak for 34th place on the all-time Bruins ranking (you can also be forgiven if you thought he was ranked higher). Within the rules, Marchand set a personal best of 39 goals last season, and he would be on a pace to shatter that this season (he has 11 in 19 games, a 47 goal pace over 82 games) but for missing eight games to injury. It matters, since Boston has lost just once in regulation in the ten games in which he scored a goal this season (6-1-3). He also has points in 15 of the 19 games in which he has dressed. In 24 career games against the Caps, Marchand is 7-8-15, minus-5. When Brett Connolly takes the ice on Thursday night, he will do so for the 300th time in his NHL career. You might not think this especially noteworthy (he will tie Barry Melrose for 2,297th place on the all-time games played list, and he will be the 455th active player to reach that mark, according to hockey-reference.com), but he will reach that mark not having yet reached his 26th birthday (next May). He has a long way to go to add to that total. In the here and now, Connolly has overcome a slow start (a goal on Opening Night, then crickets for 11 games and only two goals in his first 17 contests) to record four goals in his last six games. The amazing part of that is that he did it while recording only seven shots on goal. In another odd fact concerning this game, it will be just his second road contest getting a sweater cine November 16th. Shots on goal in road games has been a rarity for Connolly as well, his having recorded just six shots on goal in nine road contests so far, three of them in a 4-3 overtime loss to Tampa Bay last October 9th. Connolly, who spent the 2015-2016 season with Boston, going 9-16-25 in 71 games, is 1-1-2, minus-2, in six career games against the Bruins. The Capitals must like chowder. They have a five-game winning streak in Beantown, are 8-2-0 in their last ten visits to Boston, and they are 11-4-0 in their last 15 trips to New England since February 2009. 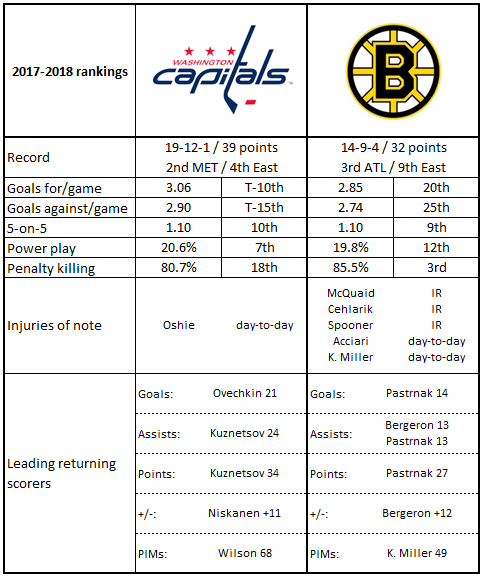 It could be a tonic for what ails the Caps on the road at the moment, a team that has suffered four losses in their last five road contests, all by multi-goal margins. They catch Boston turning things around in their own rink, but you know how this ends.